WASHINGTON -- NASA has rescheduled the media teleconference to discuss new information about the boundary of our solar system obtained from the agency's Interstellar Boundary Explorer (IBEX) spacecraft. The telecon now is set for noon EDT, on Thursday, Sept. 30. - Merav Opher, associate professor, George Mason University in Fairfax, Va.
To participate in the teleconference, reporters should e-mail JD Harrington at j.d.harrington@nasa.gov. At the beginning of the briefing, related images will be available online at http://www.nasa.gov/ibex. Tropical Storm Nicole was a tropical storm for around 6 hours before it weakened into a remnant low pressure area and is now off the Florida coast. NASA Satellite imagery captured different views of Nicole's clouds as the system weakened back into a low pressure area. While Nicole weakened, a huge trough of low pressure over the U.S. eastern seaboard from Florida to Maine has become the key weathermaker there. The trough, an elongated area of low pressure, is streaming tropical moisture from Nicole's remnants and the Gulf of Mexico, bringing high rainfall totals and severe weather up and down the coast. At 2 a.m. EDT on Sept. 30, Nicole's remnant low was still 35 miles east of Fort Lauderdale, Fla. and about 65 miles west-southwest of Freeport, the Bahamas. Nicole's remnants are forecast to merge with the giant trough (an elongated area of low pressure) later today or early Friday. Nicole's remnants, barely discernable on satellite imagery now because of the huge trough to its west, will still be bringing locally heavy rainfall over the Bahamas. There's just a 10 percent chance it will regenerate as a subtropical cyclone in the next 24 hours. The GOES-13 satellite captured a visible image of the extensive cloud cover of the trough (elongated area of low pressure) all along the U.S. East coast on Sept. 30 at 1345 UTC (9:45 a.m. EDT) that is feeding off tropical moisture from the Gulf of Mexico, and Nicole's remnants. GOES satellites are operated by NOAA and the NASA GOES Project at NASA's Goddard Space Flight Center, Greenbelt, Md. uses the satellite data to create images and animations. NASA's CloudSat satellite passed through the western section of Tropical Storm Nicole on September 29, 2010 at 0727 UTC (3:27 a.m. EDT). 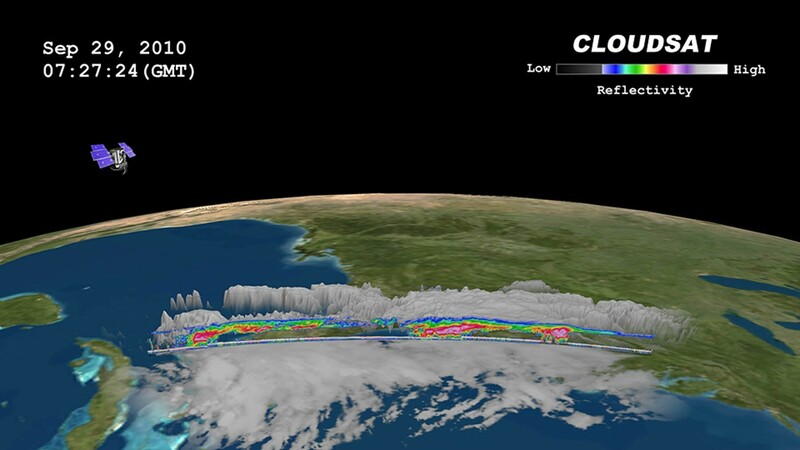 CloudSat captured an image of the elongated storm system when it was located between Cuba and Florida was in the beginning stages of tropical cyclone formation. CloudSat imagery noticed that low level cyclonic circulation was developing around the low pressure area, as it was being fueled by warm sea surface temperatures. The CloudSat image captured areas of light cumulus precipitation mixed with a stream of mid- level cloudiness, most likely altocumulus and altostratus. Deep mid-level flow from the south-southwest was evident in the image, occurring from the inclination of the clouds towards the north-northeast. On Sept. 28 at 18:20 UTC 2:20 p.m. EDT the Moderate Resolution Imaging Spectroradiometer (MODIS) instrument on NASA's Aqua satellite captured a visible image of Tropical Storm Nicole over Cuba before it weakened back into a tropical depression. Nicole was already losing her cyclonic shape at that time. The National Hurricane Center issued its final official forecast for Nicole on Sept. 29 at 5 p.m. EDT. At that time, Nicole had maximum sustained winds near 40 mph. It was about 175 miles east-northeast of Havana, Cuba and 165 miles west of Nassau near 24.5 North and 80.0 West. It was moving north-northeast near 12 mph and had a minimum central pressure of 996 millibars. At that time, it had degenerated into an elongated area of low pressure and the National Hurricane Center noted that the ill-defined low had become untrackable. Forecasters are also watching a low pressure area in the eastern Caribbean. A large area of disturbed weather associated with two tropical waves is about 800 miles east of the Windward Islands. The showers and thunderstorms in it are currently disorganized but it is expected to move into more favorable conditions. It currently has a 30 percent chance of becoming a tropical depression in the next 48 hours, so Cuba is watching it closely after being soaked by Nicole. Last week science communication colleagues from across the Agency gathered together at a conference center outside of Washington, DC to talk shop and finalize a strategic communication plan for effectively sharing EPA research results and outcomes. Dr. Anastas was not just talking to the members of the science communication team, but to everyone involved in research and development at EPA. Never the less, as you could imagine, as those on the front lines of communication we all found his words rather energizing. While at our meeting, we reviewed communication plans and consulted with one another to identify best practices across EPA’s various research labs centers, and offices. We spent time discussing ways to quantify and track our work so we can make sure we set appropriate goals, effectively reach and serve intended audiences, and work efficiently. EPA researchers working to build a computer model that simulates embryonic development, a “virtual embryo” that will serve as a screening tool for testing the toxicity of chemicals on the developing embryo. n a research project already underway, an interdisciplinary team of EPA researchers and their partners are studying the effects of near-roadway pollution on human health. Across the country, EPA ecologists and other experts are exploring ways to better understand and quantify “ecosystem services,” the myriad ways that natural ecosystems benefit human society. One research project still in the planning stages will involve tapping advanced environmental monitoring technologies placed on commercial aircraft to gather data for analysis into important environmental such as tracking climate change and air pollution globally. And these are just the first examples on my list of notes from the gathering. My colleagues and I will be working to share all of them through this blog, our Science Matters newsletter, EPA’s Web site, and other places over the coming weeks and months. Please stay tuned! About the author: Aaron Fester is the lead science writer-editor in EPA’s Office of Research and Development, and the editor for Science Wednesday. Note: The opinions expressed in Greenversations are those of the author. They do not reflect EPA policy, endorsement, or action, and EPA does not verify the accuracy or science of the contents of the blog. The purpose of this meeting is to provide advice and recommendations concerning proposals submitted to NSF for financial support and the agenda for each meeting is the review and evaluation of proposals. These meetings are closed because the proposals being reviewed include information of a proprietary or confidential nature, including: technical information; financial data, such as salaries; and personal information concerning individuals associated with the proposals. These matters are exempt under 5 U.S.C. 552b(c),(4) and (6) of the Government in the Sunshine Act. Meetings will be held at the National Science Foundation in Arlington, VA.
Science, Technology, Engineering, and Mathematics Talent Expansion Program Centers (STEP Centers) competition allows a group of faculty representing a cross section of institutions of higher education to identify a national challenge or opportunity in undergraduate education in science, technology, engineering, and mathematics (STEM) and to propose a comprehensive and coordinated set of activities that will be carried out to address that challenge or opportunity within a national context. In the current competition, efforts must be related to the biological sciences, engineering, or the geological sciences. This meeting is convened for the purpose of discussing preliminary proposals for the ENG-STEP Centers competition and for the GEO-STEP Centers competition submitted to the September 7, 2010, deadline. The meeting will open with an orientation session at 8:30 a.m. on Monday, October 18, and will adjourn at approximately noon on Tuesday, October 19. Tech Talk: How Do Fish Hear? If tuna could talk, what secrets would they share? In this week’s “Tech Talk,” Dr. Mike Traweek of the Office of Naval Research’s (ONR) Ocean Battlespace Sensing Department will answer questions about how fish detect and interpret sound in the aquatic environment. 2.) Look for the prompt to submit your questions. 3.) Submit a question. Questions will be answered on a first-come, first-served basis. 4.) Return at 11 a.m. , Sept. 29, to watch as he answers questions in real time. Think about it in human terms: Driving at 30 mph with windows down and air rushing in, would you be able to detect the distance and incoming direction of an ambulance from half-mile away? ONR would like to understand whether fish, like the Atlantic bluefin tuna, can swim at high speeds and still pinpoint sound and its direction over the flow of water along their bodies. If so, imagine the biological science that might be applied to underwater detection and sensing. Next-generation sensors must be smaller, more affordable and energy efficient. With fewer ships in the ocean today, it’s imperative that naval forces advance their ability to detect acoustic signals from greater distances, whether towed from manned vessels or secured in unmanned undersea vehicles. Dr. Traweek is a project officer for ONR’s Maritime Sensing Team. He has developed and managed projects ranging from mine countermeasure and anti-submarine warfare future naval capabilities to advanced submarine combat systems development. Traweek’s research portfolio broadly addresses the design and utilization of complex systems supporting undersea warfare. These interactive 30-minute conversations take place weekly on Wednesdays, leveraging ONR’s presence on Facebook and Twitter to take questions from the general public about our scientific research. More on ONR’s challenge topics (to be featured at the upcoming conference) can be found on the ONR web site at: www.onr.navy.mil/Conference-Event-ONR/science-technology-partnership/2010-CNR-Challenge.aspx. Engineers are evaluating five lightning strikes that occurred yesterday afternoon within five miles of Launch Pad 39A at NASA's Kennedy Space Center in Florida. Preliminary sensor readings indicate there has been no damage to the pad or to space shuttle Discovery. Engineers will meet this afternoon to evaluate data. NASA forecasters say Tropical Depression 16 is expected to pass offshore early Thursday morning bringing heavy rain and wind to Kennedy today. TD 16 isn't expected to have a severe affect on the center. The center remains open and Discovery will remain on its launch pad. Technicians continue leak checks today of the quick disconnects on Discovery's auxiliary power units. STS-133 Commander Steve Lindsey and Pilot Eric Boe will fly shuttle training aircraft runs around the White Sands Space Harbor, N.M. while their crewmates review procedures for the two spacewalks during the mission at NASA's Johnson Space Center. NASA's Langley Research Center and the National Institute of Aerospace, both in Hampton, Va., are sponsoring TEDxNASA at the Ferguson Center for the Arts in nearby Newport News. It is free and open to the public and will be streamed on the TEDxNASA website. Registration opens on Oct. 11 and runs through Oct. 24. For more information on the event and how to register, visit http://tedxnasa.com. [Narrator]: Hurricane Katrina. One of the most devastating natural disasters in US history. More than 1800 people lost their lives while countless others lost homes and livelihoods. Five years later, the waters have receded but Katrina's legacy remains. Why did Katrina become a category 5 storm in the Gulf of Mexico? And what made it weaken before landfall? It's questions like this that NASA researchers hope to answer this hurricane season. The Genesis and Rapid Intensification Processes mission, or GRIP, is a field experiment that looks at how tropical storms form and develop into major hurricanes. [Kakar]: This experiment is designed not only to help the experts better understand which of the tropical disturbances will develop into tropical storms or hurricanes, but also help them predict which ones will intesify to monsters and which ones will fizzle out rapidly. [Narrator]: During the 2010 hurricane season, NASA deplyed its piloted DC-8 and WB-57 and unmanned Global Hawk aircraft in a massive effort to collect as much data as possible, arming hurricane researchers with the information needed to predict the growth and intensification of hurricanes. [Braun]: With the DC-8 and in particular the wind LIDAR we're going to get continuous wind measurements in the environment of the storm, something that we've never been able to get before. With the Global Hawk, the expectation is that because of its 30 hour duration, flight duration, we're going to be able to be out over storms for up to 20 hours or so, which is about 2-4 times longer than what we'd be able to do with conventional aircraft. When you're out there only getting very brief looks for short periods of time it's very easy to miss those critical events. And so, with GRIP we think we have a very good chance of being able to see those processes much more easily than we've been able to do in the past. [Narrator]: Each aircraft brings its own set of expertise. The DC-8, stationed in Ft. Lauderdale, carries NASA researchers into hurricanes, allowing them to study the storm from the inside out. It is capable of reaching altitudes of 42,000 feet and is helping scientists with sensor development and verification and studies of the planet's surface and atmosphere. The Global Hawk- This remotely piloted aircraft, stationed out of California, is capable of flying at 60,000 feet and is providing information on lightning, wind speed and other environmental factors in a tropical cyclone. The WB-57, stationed in Houston, Texas, is a high altitude, piloted airplane capable of reaching the dizzying height of 65,000 feet. It's instruments retrieve data on the upper atmosphere. This fleet of specially outfitted aircraft will give researchers an unprecedented look inside the mechanics of storms. [Braun]: The benefit of studying hurricanes with so many instruments at once is that it gives us a more complete description of the atmosphere, both within the storm and in the environment. Within the storm, we want information not only on the winds within the storm, but also the temperature, humidity, and precipitation in the eye, the eye wall, and the rain bands. All that information is critical to understanding how the storms evolve. [Narrator]: GRIP will also gather data from a much higher vantage point, outer space. The TRMM, Aqua, Terra, and Cloudsat satellites provide data to scientists on Earth, giving them a comprehensive look at storms from different perspectives. [Halverson]: GRIP is designed to take the latest technologies that NASA can bring to bare. Satellites, aircraft that fly in the storm, aircraft that fly over the storm, systems on the ground, let's put it all out there for 6 weeks and see what we can learn about the physics of these storms. [Narrator]: The flights conducted through GRIP this hurricane season will undoubtedly provide vital information on the lifecycle of hurricanes. This information will help scientists predict the birth of potential hurricanes and understand why some tropical cyclones can go from a category 2 to a category 5 hurricane in a matter of hours. That engine of innovation is especially important within the national defense arena and the science, technology, engineering and mathematics fields. Such skills are critical for careers in systems design and manufacturing, and a strong manufacturing base is essential to maintaining a well-built defense. To reignite a passion for exploration among our nation’s youth, the Defense Advanced Research Projects Agency (DARPA) is launching its Manufacturing Experimentation and Outreach (MENTOR) initiative. Eremenko envisions a significant deployment of technology to schools. “DARPA will pilot this activity with 10 high schools by our second year and expand to 100 by the third year, with plans for 1,000 by the fourth,” said Eremenko. To reach this goal, DARPA released a draft solicitation, explicitly encouraging small businesses, non-profits, academia and other non-traditional U.S. and international researchers with capabilities in science, technology, engineering and mathematics to submit proposals for executing the four-year, $10M MENTOR initiative. MENTOR is part of DARPA’s Adaptive Vehicle Make (AVM) program, a larger effort to dramatically compress development timelines for future defense vehicles, shift the product value chain toward high value-added design activities and democratize the innovation process. AVM seeks a “fab-less” approach to design of correct-by-construction cyber-electro-mechanical systems, a foundry-style bitstream programmable manufacturing capability and a crowd-sourcing infrastructure for development of vehicle systems similar to open-source software today. AVM will culminate in a prize-based design and fabrication of a next-generation infantry fighting vehicle for the U.S. Army. MENTOR’s role is to help ensure a competitive next-generation workforce to enable and sustain this new design and manufacturing construct developed by AVM. Interested parties may attend the virtual Adaptive Vehicle Make Proposers’ Day. Additional information and registration instructions are available at http://go.usa.gov/xwR. Draft versions of the MENTOR solicitation may be found at http://go.usa.gov/xwN. The Defense Advanced Research Projects Agency (DARPA) is the research and development office for the U.S. Department of Defense. DARPA’s mission is to maintain technological superiority of the U.S. military and prevent technological surprise from harming our national security. We also create technological surprise for our adversaries. HOUSTON -- NASA will preview the next space shuttle mission, the final flight of shuttle Discovery and the next to last scheduled shuttle flight, during a series of news briefings Thursday, Oct. 21, at the agency's Johnson Space Center in Houston. NASA Television and the agency's website will broadcast the briefings live. Reporters will be able to ask questions from participating NASA locations. Discovery is targeted to launch Nov. 1 on the 11-day STS-133 mission to the International Space Station. The shuttle will deliver the Permanent Multipurpose Module (PMM), which was converted from the multi-purpose logistics module Leonardo. The PMM will provide additional storage for the station crew, and experiments may be conducted inside it. Discovery also will carry critical spare components and the Express Logistics Carrier 4, an external platform that holds large equipment that can only be transported using the unique capability of the shuttle. Robonaut 2, or R2, will be the first human-like robot in space when it flies on Discovery inside the PMM to become a permanent resident of the station. Astronaut Steve Lindsey will command Discovery. Eric Boe is the pilot. They will be joined by Mission Specialists Alvin Drew, Tim Kopra, Michael Barratt and Nicole Stott. Kopra and Drew are scheduled to perform two spacewalks to do maintenance work and install new components. The crew will be available for interviews at Johnson by phone or in person after the briefings. Reporters must contact Gayle Frere at 281-483-8645 by 5 p.m. on Oct. 18 to reserve an interview opportunity. Reporters planning to attend the briefings or interviews in Houston must contact the Johnson newsroom at 281-483-5111 by 5 p.m. on Oct. 14 for credentials. For the latest information about the STS-133 mission and its crew, visit http://www.nasa.gov/shuttle. NASA's Aqua satellite has peered into the cloud tops of System 96L in the western Caribbean early this morning and noticed that they've become colder and higher, which indicated the storms was strengthening and organizing. Just over eight hours later, the new Tropical Depression 16 was born, and now has the potential to become a tropical storm before it merges with an elongated area of low pressure near the Florida late on Wednesday. Tropical Depression 16 was officially named this morning, Sept. 28 at 11 a.m. EDT by NOAA's National Hurricane Center in Miami, Fla. Many watches and warnings have also already been posted this morning. At 11 a.m. Tropical Depression 16's center was about 180 miles south of Havana, Cuba and 390 miles south-southwest of Miami, Fla. near 20.6 North latitude and 82.5 West longitude. It is moving north-northeast near 10 mph and had maximum sustained winds near 35 mph. Its minimum central pressure was 1001 millibars. The government of the Cayman Islands has issued a Tropical Storm Warning for all of the Cayman Islands. The government of Cuba has issued s Tropical Storm Warning for the Cuban provinces from Mantanzas eastward to Ciego De Avila. The government of the Bahamas has issued a tropical storm warning for the Northwestern and Central Bahamas. This Warning Includes the Abacos, Andros Island, Berry Islands, Bimini, Eleuthera, Grand Bahama Island, New Providence, Cat Island, the Exumas, Long Island, Rum Cay, and San Salvador. In the U.S., Florida is under a Tropical Storm Warning and Watch. A Tropical Storm Warning has been issued for the Florida coast from Jupiter Inlet southward to East Cape Sable, and for all of the Florida Keys, including Florida Bay and the Dry Tortugas. A Tropical Storm Watch has been issued for the west coast of Florida from north of east Cape Sable to Chokoloskee and for the east coast of Florida from north of Jupiter Inlet to Sebastian Inlet. The Atmospheric Infrared Sounder instrument, known as AIRS has the ability to determine cloud top and sea surface temperatures from its position in space aboard NASA's Aqua satellite. Cloud top temperatures help forecasters know if a storm is strengthening or weakening. When cloud top temperatures get colder it means that they're getting higher into the atmosphere which means the "uplift" of warm, moist air is stronger and it will form stronger thunderstorms (that power a tropical cyclone). When cloud-top temperatures warm up it means that the cloud tops are lower than they were before, indicating that the storm is weakening. 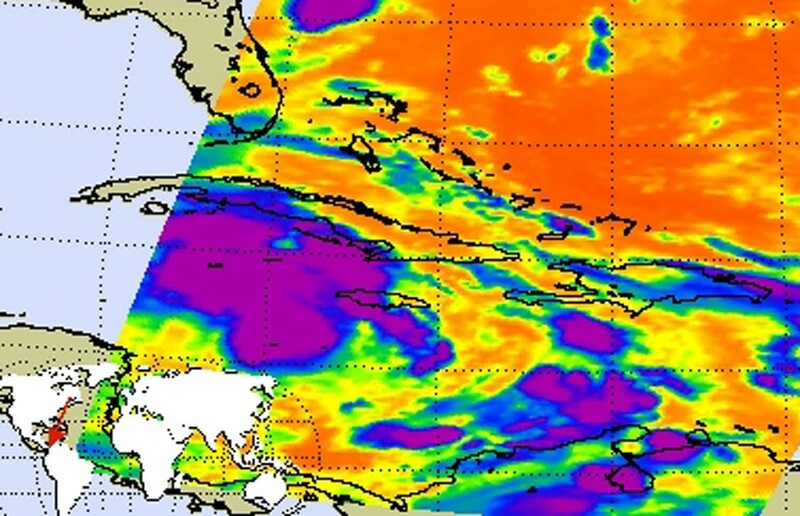 When the Aqua satellite passed over Tropical Depression 16 (TD16) from space on Sept. 28 at 0635 UTC (2:35 a.m. EDT) the AIRS instrument took the temperature of the cloud tops in the storm and found them to be as cold as or colder than -63 Fahrenheit throughout a very large area within TD16, indicating the storm had a good amount of energy to power it up. The area of strong thunderstorms in the AIRS images is quite large, and TD16 is already raining on western Cuba. The Geostationary Operational Environmental Satellite known as GOES-13 flew over Tropical Depression 16 on Sept. 28 at 1425 UTC (10:25 a.m. EDT) as it strengthening into a depression. GOES-13's visible imagery showed a large extent of cloud cover, spanning over Cuba and Jamaica, the Cayman Islands and northeastward into south Florida. The National Hurricane Center (NHC) in Miami, Fla. noted this morning, Sept. 28 at 8 a.m. EDT that TD16 is going to bring some heavy rains and squally conditions in the Caribbean. NHC said, "Heavy rains and strong gusty winds to tropical storm force are expected to affect the Cayman Islands, Jamaica and Cuba today. These weather conditions are likely to spread over the Florida Keys, southern Florida and the northwestern Bahamas later today and Wednesday." During the morning hours of Sept. 28, the strongest winds were happening about a couple of hundred miles east and south of the Isle of Youth, Cuba and Grand Cayman. If TD16 strengthens into a tropical storm, it would be named Nicole. South-southwesterly vertical wind shear associated with a large upper-level trough moving into the southeastern U.S. is expected to limit the storm's intensification, although it is near tropical storm-force this morning. The projected track of the TD16 takes it in a north-northeasterly direction across Cuba toward southeastern Florida. Meanwhile, there's another female named storm that's still making waves in the Atlantic Ocean basin, Julia. However, Julia is just a remnant low pressure area and is about 150 miles south-southeast of Bermuda. This remnant low is moving west-northwest near 15 mph and is not in a good environment for redevelopment. The NHC gives Julia's remnants a meager ten percent chance of redeveloping in the next 48 hours, so TD16 is the one to watch. Narrator: Astronomers have just begun imaging planets around other stars the technique isn't very advanced yet, and it can't see any planets as small as those in our own solar system. But let's suppose for a moment that alien astronomers are looking at our planetary system. Could they find any evidence that planets exist around the sun, even if they couldn't see the planets themselves? The answer is probably yes. That's because at least one world in our solar system would make its presence known by its effects on a huge cloud of dust at the fringes of the solar system in a place called the Kuiper Belt. The Kuiper Belt is a kind of cold storage zone out beyond Neptune, occupied by millions of icy bodies, including Pluto. The icy objects in the Kuiper Belt release dust that from afar, could appear as a hazy disk at infrared wavelengths. New computer models created by NASA scientists, shown here, reveal what dust in the Kuiper Belt might look like to an alien astronomer. Neptune creates the intricate pattern. The massive planet's gravity tugs on the clouds dust grains, nudging them in their orbits. Stark: Neptune creates a ring structure in the dust cloud which features a gap where the planet itself resides. And this gap should make it fairly easy to tell where Neptune is from afar, even at distances where the planet is too dim to detect directly. The supercomputer simulations that Marc Kuchner and I performed also allow us to see what the dust in the solar system may have looked like when the solar system was much younger. In effect, we can go back in time and see how the distant view of the solar system may have changed. Narrator: In its youth, the Kuiper Belt contained many more objects and, consequently, lots more dust. In fact, the dust was so thick that the particles themselves often collided. Stark: When we included collisions between dust particles, we were really amazed by what we saw. Narrator: Successively younger models of the Kuiper dust cloud show progressively simpler structure, eventually leading to a single narrow ring beyond Neptune's orbit. Stark: Dust collisions change Neptune's gravitational imprint. The gap in the ring disappears. The amazing thing is, we've already seen ring structures like this around other younger stars, like Fomalhaut. In terms of dust, we now know that these other systems may look similar to our young solar system. Narrator: Dust around other stars can tell us a lot about possible planets, just as in our own solar system, it could reveal Neptune. The external tank for space shuttle Endeavour's STS-134 mission was taken off the Pegasus barge this morning and moved to the Vehicle Assembly Building. Technicians there will process and stack the tank for the launch next year. The tank was towed beginning just before 9:30 a.m. at NASA's Kennedy Space Center in Florida. Processing also moves ahead for the STS-133 mission. Technicians will conduct leak checks today on the quick disconnects for space shuttle Discovery's forward reaction control system and auxiliary power units. The shuttle is at Launch Pad 39A at NASA's Kennedy Space Center in Florida, the launch site of all the shuttle missions. At NASA's Johnson Space Center in Houston, training home to the astronauts, the STS-133 crew will practice procedures in the Neutral Buoyancy Laboratory for the mission's first spacewalk. Department of Homeland Security (DHS) Secretary Janet Napolitano today announced the beginning of Cyber Storm III—a three-day long, DHS-sponsored exercise that brings together a diverse cross-section of the nation’s cyber incident responders to assess U.S. cyber response capabilities. Cyber Storm III is an exercise scenario that simulates a large-scale cyber attack on critical infrastructure across the nation. The goal of the exercise is to examine and strengthen collective cyber preparedness and response capabilities, involving thousands of participants across government and industry. As part of Cyber Storm III, DHS will exercise elements of the newly-developed National Cyber Incident Response Plan (NCIRP)—a blueprint for the Nation’s cybersecurity incident response. •Administration-Wide—Seven Cabinet-level departments including Commerce, Defense, Energy, Homeland Security, Justice, Transportation and Treasury, in addition to the White House and representatives from the intelligence and law enforcement communities. •Eleven States—California, Delaware, Illinois, Iowa, Michigan, Minnesota, North Carolina, New York, Pennsylvania, Texas, Washington, as well as the Multi-State Information Sharing and Analysis Center (ISAC). •12 International Partners—Australia, Canada, France, Germany, Hungary, Italy, Japan, the Netherlands, New Zealand, Sweden, Switzerland, and the United Kingdom. •60 Private Sector Companies—DHS worked with representatives from the Banking and Finance, Chemical, Communications, Dams, Defense Industrial Base, Information Technology, Nuclear, Transportation, and Water Sectors, as well as the corresponding Sector Coordinating Councils and ISACs, to identify private sector participants. Cyber Storm III also represents the first major exercise testing the new National Cybersecurity and Communications Integration Center (NCCIC)—which serves as the hub of national cybersecurity coordination and was established in October of 2009. For more information on Cyber Storm III, please visit: www.dhs.gov/files/training/gc_1204738275985.shtm. 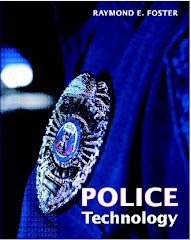 For more information on the progress DHS has made in strengthening cyber preparedness and response capabilities, please visit: www.dhs.gov/xlibrary/assets/defending-against-cyber-attacks-september-2010.pdf (PDF, 4 pages - 35 KB). WASHINGTON -- NASA will host a media teleconference at 1 p.m. EDT, on Wednesday, Sept. 29, to discuss new information about the boundary of our solar system obtained from the agency's Interstellar Boundary Explorer (IBEX) spacecraft. Reporters can receive dial-in information by sending an email to JD Harrington at j.d.harrington@nasa.gov. Requests must include reporter's name, affiliation, and telephone number. Put on the gloves. Turn on the camera and...action! Nine-year-old Thomas Nelson is playing a video game called "CopyCat," which is a unique and fun way to learn sign language. Thomas was 2 years old when doctors determined he was profoundly deaf. His mother, Cheryl Nelson, says he couldn't hear the sound of a honking horn from an oncoming truck. "My first thought when I found out he was deaf was I was never going to hear my son tell me that he loved me," recalls Nelson. Six years later, Thomas not only signs "I love you" to his mother, she signs back. Nelson is in the minority in her ability to sign with ease. American Sign Language (ASL) is not an easy language to learn. It's equivalent to an English speaker learning Japanese. Studies show as many as 75 percent of hearing parents of deaf children never become fluent signers. "So that means only 25 percent of the kids are really getting good sign language at home," notes computer scientist and Georgia Tech professor Thad Starner. "They're so behind in learning the language that they're not really learning the lessons in school." Alarmed by these statistics and with support from the National Science Foundation (NSF) and the Department of Education Institute of Education Sciences, Starner began to develop interactive tools, such as "CopyCat," to make sign language easier to learn for both the deaf and the hearing communities. For example, Starner and his team are developing a cell phone app called "SmartSign" to help hearing people, such as Nelson, who get stuck on a word. So, let's say she doesn't know how to sign the word "careless." She picks up her cell phone and says "careless" into the speaker and up pops a person signing "careless." It takes seconds to do. "It gives you the sign," exclaims Nelson. "Wow! That's a huge help. We carry our cell phone everywhere." There's even a fun quiz that helps parents practice signing almost anywhere. Starner's colleague, Jeff Wilson, is reviewing and practicing sign language while he waits for the bus. "You speak the word you want, it uses voice recognition and it'll just bring up the video right for you," he says. And, even though his son, Wyatt, can hear, Wilson started teaching him simple signs months before Wyatt could talk. "Whenever we gave Wyatt a bottle of milk, we would do the America Sign Language sign for milk. Eventually, he would start doing it without any prompting. You don't have them crying. They tell you what they want," explains Wilson. So instead of crying for his bottle, Wyatt knows the sign. Wilson says it makes for less cranky kids when they can communicate their needs. "CopyCat" is being developed primarily for classrooms. A child like Thomas will put on special gloves with motion sensors and sit in front of a large computer screen. The screen is divided. In one section, there is a person signing a phrase for the child to emulate. A camera tracks the child's hand movements and when Thomas signs correctly, he earns points and moves to the next level. The center of the screen is where the animated action takes place. "So 'CopyCat' is an educational game where children have to help Iris the cat find where evil monsters have stolen something. Iris is a blue-eyed white cat. Blue-eyed white cats are mostly deaf. Iris is the mascot of the game," explains Starner. "We've tested 'CopyCat' in three different schools and each time, we're seeing significant results in just two weeks," continues Starner. "The children actually were able to improve their ability to understand sign, be able to generate sign and to repeat sign phrases. This is very exciting. It's a great way to learn." Starner's team is also developing an English-to-American Sign Language dictionary. And, they're even adding sign language to classic cartoons, such as "The Three Bears," and more recent children's animated literature, such as "Danny and the Dinosaur," to enhance language and literacy development in a fun, enjoyable manner. For more information about "SmartSign," "CopyCat" and other ASL tools and resources, go to the Center for Accessible Technology in Sign (CATS). Navy researchers are supporting today’s warfighter with new advances in biomedical research and development. “Medical research and development activity provides the inspiration for discovery and further development of new ideas, new concepts, new drugs or surgical interventions,” Dr. Wayman Cheatham, special assistant for medical research to the Navy surgeon general and director of the Navy Bureau of Medicine and Surgery’s Navy Medicine Research and Development Center, said during a DoD Live Bloggers Roundtable yesterday. Cheatham said Navy Surgeon General Vice Adm. (Dr.) Adam M. Robinson Jr. has established five areas of priority in terms of strategic research to support the Defense Department as a whole as well as those under the care of Navy Health. Those priorities are traumatic brain injury and psychological health, medical system support for maritime and expeditionary operations, wound and injury management throughout the continuum of care, hearing restoration and protection and undersea medicine. This overall research the Navy does to support these areas include surveillance for emerging disease, drug and vaccine development, researching environmental toxins, and medical research and development supporting force protection. To support these efforts, the Navy has medical research and clinical investigation operations on five continents, as well as among the islands of the Pacific Ocean. Cheatham said one of the Navy’s latest developments in research has been trying to determine the best agent to stop bleeding in people wounded on the battlefield. Through a collaborative effort with the Army, researchers developed QuikClot combat gauze, a wrap for wounds that seems to be more effective in controlling bleeding. He said the latest technologies in wound and injury management are providing the greatest degree of survival and return of individuals to functionality following injury in any conflict. The Navy also is researching the use of hyperbaric oxygen chambers in treating traumatic brain injury and post-traumatic stress, he said. Monitoring the long-term effects of service on submarines to determine whether unanticipated situations develop or health concerns emerge is another area of ongoing research, Cheatham said, and Navy researchers also are working with agencies such as the Centers for Disease Control and the World Health Organization in vaccine development. Citing concerns about using resources to the fullest extent possible, Cheatham said he can assure the public that the Navy is carrying out its commitment to the highest caliber of research and medical education, and that those two areas are being maintained as strategic priorities for the Navy. “New linkages between research and development and our clinical activities at our medical treatment facilities are evidence of this type of commitment,” he said. This blog post was shared with us by the American Forces Press Service (AFPS). For more information about the space station, visit http://www.nasa.gov/station. To follow Twitter updates from Expedition 24/25 crew member Wheelock and Exp. 26 Commander Kelly, visit http://twitter.com/Astro_Wheels, http://twitter.com/StationCDRkelly. CAPE CANAVERAL, Fla. -- Reporters are invited to two historic Space Shuttle Program events at NASA's Kennedy Space Center in Florida on Tuesday, Sept. 28. The final solid rocket booster (SRB) assembly will depart the Assembly and Refurbishment Facility, and the external fuel tank for the last planned shuttle flight will be removed from the barge that carried the tank from Louisiana. NASA will provide video and still images of both events. The SRB event, scheduled to begin at 9 a.m. EDT, consists of a ceremony, photo opportunity, and media interview opportunities with a booster project expert. At approximately 10:30 a.m., there will be a photo opportunity of the tank being towed off the Pegasus barge and into Kennedy's Vehicle Assembly Building, and interviews with External Tank/Solid Rocket Booster Vehicle Manager Alicia Mendoza. Reporters must arrive at Kennedy's news center by 8 a.m. for transportation to cover the SRB event. Journalists will be located in the turn basin parking lot for the tank opportunity. The final train carrying shuttle solid rocket booster segments arrived at Kennedy on May 27. The segment cars travelled across the country after departing the ATK solid rocket booster plant in Promontory, Utah. ATK Launch Systems manufactures and tests the solid rocket motors. The assembly would be used in the solid rocket boosters designated for shuttle Atlantis' STS-335 rescue mission, in the unlikely event it was needed. The tank, designated ET-122, will support shuttle Endeavour's STS-134 mission targeted for launch in February. It departed NASA's Michoud Assembly Facility in Louisiana on Sept. 21, to begin the six-day, 900-mile sea journey. The barge will arrive at Kennedy on Sept. 27. The tank will be offloaded on Sept. 28.
International media accreditation is closed for these events. U.S. reporters without permanent Kennedy credentials must apply for accreditation by noon, Sept. 27. Reporters requesting accreditation must apply online at https://media.ksc.nasa.gov. Badges for the events may be picked up Sept. 28 starting at 6 a.m. at the Kennedy Space Center Badging Office on State Road 405. Video highlights of the tank move will air on NASA Television's Video File Tuesday afternoon. For NASA TV downlink information, schedules and links to streaming video, visit http://www.nasa.gov/ntv. Images of the events will be posted on Kennedy's Media Gallery at http://mediaarchive.ksc.nasa.gov. For more information about the Space Shuttle Program and missions, visit http://www.nasa.gov/shuttle. HAMPTON, Va. -- NASA has selected Earth Resources Technology Inc. Laurel, Md., to provide proposal evaluations, assessments and studies supporting NASA Earth and space science programs and missions. The five-year maximum value of the Evaluations, Assessments, Studies, Services and Support task order contract is $91 million. The contract will provide support to the NASA Science Office for Mission Assessments, located at NASA's Langley Research Center in Hampton, Va., on behalf of NASA Headquarters’ Science Mission Directorate and other NASA offices. Earth Resources Technology will support evaluation of proposals submitted in response to announcements of opportunity, NASA research announcements, cooperative agreement notices, or other broad agency announcements in the areas of technical, management, cost, schedule and other areas defined in individual task orders. The company also will assess and study current and potential NASA programs and missions. The reviews will look at several aspects that are likely to impact mission performance, such as management and cost. The full meeting agenda is posted here. This meeting will be webcast live on Friday, September 24. Public visitors and media representatives are invited to attend all open sessions, subject to provisions of the government in the Sunshine Act. Journalists interested in attending and covering the board meeting and/or interviewing NSF/NSB officials should contact Lisa Van Pay at 703-292-8796. All meeting sessions will be held in the Jacket Legacy Room at the David B. Miller Yellow Jacket Student Union, on the campus of Black Hills State University (BHSU) in Spearfish, S.D. The NSB is the 25-member policymaking body for the National Science Foundation and advisory body to the President and Congress on science and engineering issues. Drawn from universities and industry, and representing a variety of science and engineering disciplines and geographic areas, NSB members are selected for their eminence in research, education, or public service, and records of distinguished service. The NSB has 24 members that serve six-year terms. The 25th member is the NSF Director, an ex officio member of the NSB. For more background on the NSB and its current composition, visit its website.